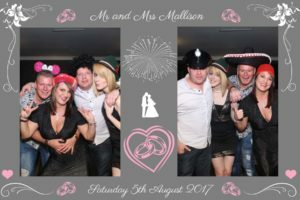 On 5th August 2017 we took the Star Eventz Magic Mirror Booth to Nottingham for the wonderful wedding of Mr & Mrs Mallison at The Nottinghamshire Golf and Country Club. The Nottinghamshire Golf and Country Club is situated in Stragglethorpe, just 6 miles from Nottingham City Centre. It is an absolutely beautiful wedding venue with a lake view restaurant and golf course. The Golf course itself has some of the most stunning landscapes in the region and the staff members are very keen and attentive too, so a great choice of venue for a wedding. Back in May this year I had the absolute pleasure of meeting Holton and Sarah Mallison. Our meeting was based on their enquiry into hiring our Magic Mirror photo booth, although they had no idea what it did, how it worked or even what it looked like so we were extremely excited to show them. They explained that they were getting married at one of Nottinghamshire’s premier wedding venues and they would like to know if we were available for that date in August. We were free on their chosen date so we invited them both to come over and have a look at the mirror, which they did and they were not disappointed. They liked the fact that because it was open all their guests would see what was going one and that it would have all the guests involved at some stage of the evening. 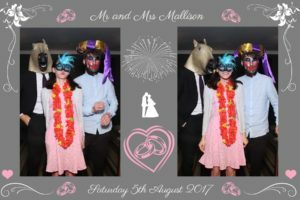 They also loved all the features such as the ability to personalise the Magic Mirror photo booth which meant they could add text and their own design on the photo template surround and that the Magic Mirror itself has animations on it that reflect the type of event that it is used for. 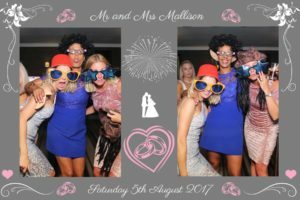 They also thought the touch screen feature was great and they liked the fact that you can sign your signature, leave a message or stamp an Emoji on each printed photo for a more memorable photo booth experience. The two of them were excited to have the Magic Mirror for their wedding day and very quickly decided to book our services. The package they chose was our Gold 3-hour package and included a friendly booth attendant and guestbook with an extra copy of the photos taken on the magic mirror, red carpet and rails, box of fun props and a USB stick with all the photos saved onto it. The Mirror itself was set up slightly earlier than the booking time to avoid any delays or disruption to the event itself and it had a queue of people waiting for me to set it up so that they could have a go up as soon as we walked through the door with the mirror. The Magic Mirror Booth was well received by everyone from the 3 years old toddlers to the senior members of the family. The whole experience went down very well the host and the guests all seemed to love the Magic Mirror with many recommending our services to others for their weddings, birthdays, and corporate events. We placed a guest book at the side of the Magic Mirror photo booth which was received very well by the guests, all of which made sure they visited the booth and signed a personal message in the guest book for the host to treasure for ever. This wedding was very well organised and it was a pleasure being a part of it as the Magic Mirror played a huge part in bringing people together through fun, laughter and photos. Unlike a traditional photo booth everyone can see the fun and goings on as opposed to the guests being hidden once inside the traditional booth. It is also a great way to ensure you have photos of all of your guests as guests often get missed out of wedding photographs. With a Magic Mirror photo booth, the guest come to the booth whenever they want or when they are ready and will pose and be themselves as and when ever it suits them resulting in more creative and fun photos, even for the shyest of guests and especially with a pair of silly glasses or a wig on. Want to book the Star Eventz Magic Mirror Photo Booth for your big day or next big event? Then drop us an email on [email protected] and let us know your dates and we will let you know what we can do for you.